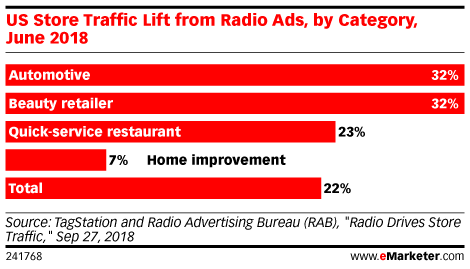 Data is from the September 2018 TagStation and Radio Advertising Bureau (RAB) report titled "Radio Drives Store Traffic." The report analyzed 1.5 million radio spot plays for 10 brands in the top 100 US markets, collecting listener data during April 1-June 30, 2018. The report covered 7 week days, across a variety of formats relative to each brand's campaign spots. 107,000 exposed FM smartphone listeners out of 515,000. Listeners were matched to Freckle location data. TagStation is a radio station cloud service provider.